The Korean program offers undergraduates a minor. A full course listing is available on the GW Bulletin. You may also find information about Korean language awards and scholarships here. Department Approval: Once the minor application form has been completed, the student can bring the form to EALL for the departmental approval at 469 Rome Hall. Normally the form can be picked up within a week. Profile: Please fill out the Minor Profile Form as soon as you have declared your minor. Study Abroad Program: Students are encouraged to participate in a study abroad program. Placement Exam: If you are not a beginner, take the placement exam here. The following requirements must be fulfilled: 18 credits in required courses for the minor and the introductory language sequence. 12 additional credits in KOR courses at the 3000-4000 level approved by the department. 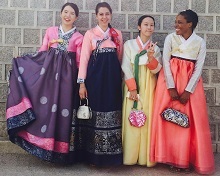 The new major in Korean is starting in the fall, but the honor of GW’s first Korean major actually belongs to Janelle McDowell (rightmost in the photo below), who created her own Korean major back in 2015. Here is her recent letter to us. Keep up with news about the Korean Program. Learn about scholarships, internships, and cultural events.